Ubuntu 11.04 or Natty Narwhal (code name) is the successor to Ubuntu 10.10 (Lucid Lynx), with a lot of major improvements in user interface and interaction (it’s more slick, fast and better looking than its previous versions). 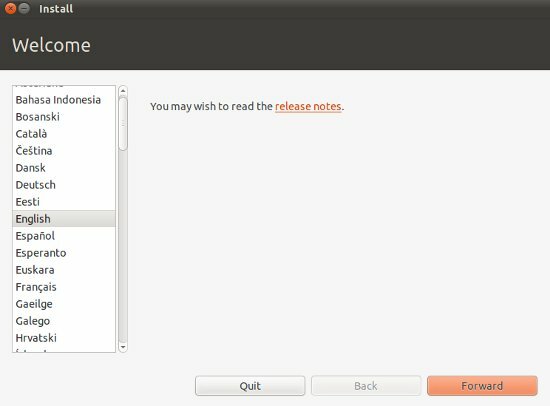 Ubuntu 11.04 has Unity Desktop as the default desktop (although classic desktops are also available in login menu), instead of GNOME as you expected (because Ubuntu has been using gnome from the beginning). Some other features has been added – e.g Ubuntu Software Center has now ratings (in terms of stars) and reviews(in the form of comments) available for each application, Windows options has been shifted to panel (top),which appears on Mouse Hover…and so on. Ubuntu has now become the most popular Linux distribution among the desktop users. it’s open source, free, user friendly, fast and in short ..it’s a lot of Fun! 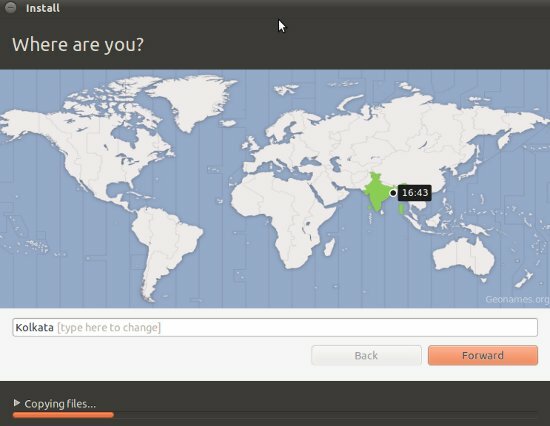 Ubuntu 11.04 can be installed in many ways – You can install it from USB(Universal Serial Bus) or CD (or you can just boot your system from Live CD/Pendrive without affecting your existing operating system on your computer). 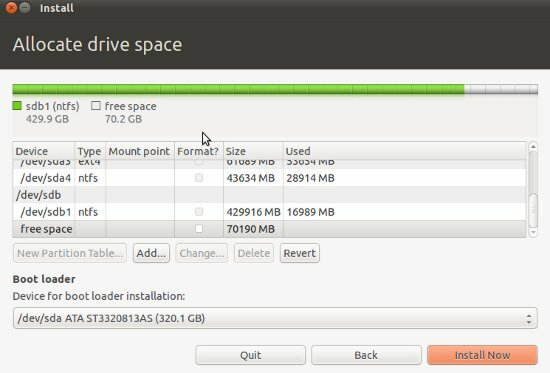 In this post, I’ll cover both the methods – step by step with full explanation – installing Ubuntu from USB as well as from CD/DVD. 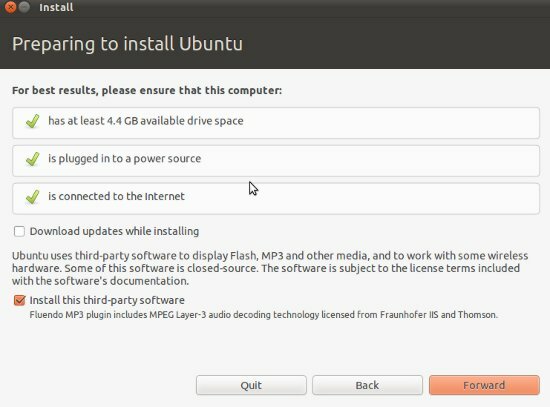 This guide will help you in installing Ubuntu in parallel with other OS like Windows 7, if you want only Ubuntu, then it’s much easier, but not recommended if you play a lot of Games or you use some softwares that is windows dependent. step #1 : Download the ISO Image from it’s official website. Select the correct architecture and download the iso file. 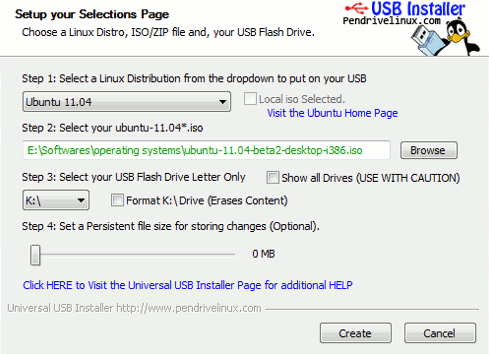 step #2 : Create a bootable USB using Universal USB Installer (a windows application that will create a bootable/live USB from the ISO file of Linux Distros, it supports a number of Linux Distros including Ubuntu 11.04 ). Select the Ubuntu 11.04 in Linux Distribution menu and locate the ISO File(You got it in step #1), although in most of the case it will automatically detect it. Now, select the USB Drive, which you want to make bootable, check the format option if you haven’t already formatted it. 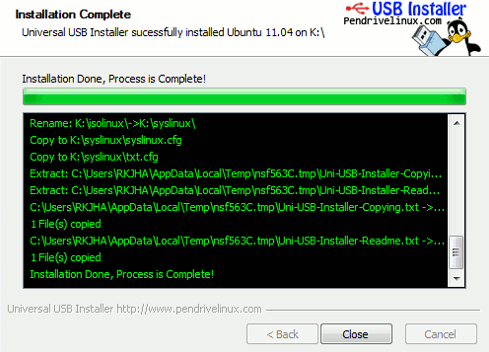 Then the click on Create button to begin the process..wait for few minutes until the installation process is complete. step #4 : Now this is the most critical step, where most people feel difficult in dealing with Ubuntu or any other Linux Distros. 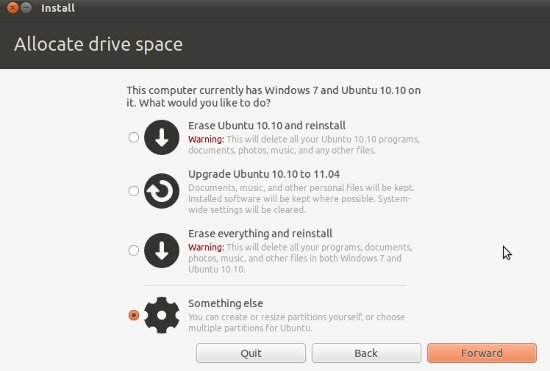 Option – 1 : Erase Everything and Reinstall – it will delete everything (all the data/files and other OS like Windows 7) and reinstall Ubuntu 11.04 on your hard drive. If you select this option then you can skip few steps, although it’s not recommended, better go for second option. Then click on ‘Install Now’ button to proceed. step #5 : Now Enter some basic information during the installation procedure and hit Forward button. 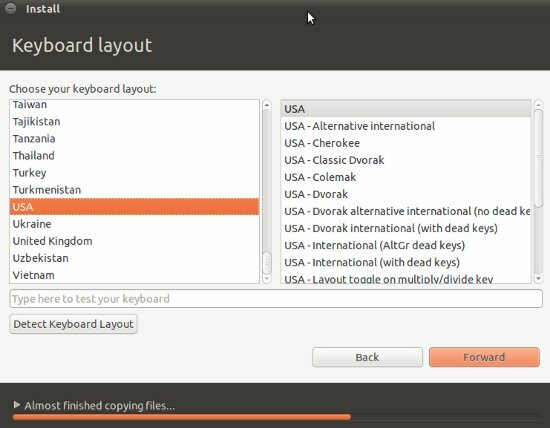 Then, select the keyboard Layout, leave it default if you aren’t sure. 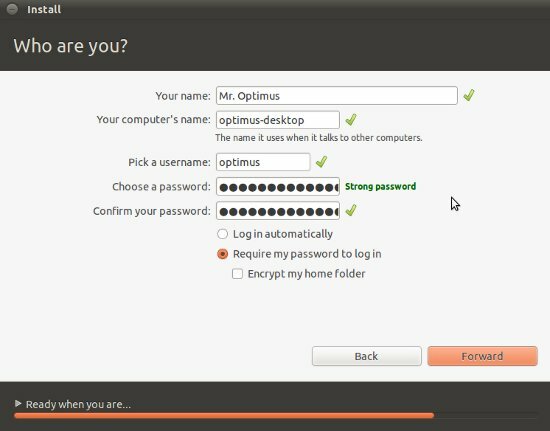 Then Enter some basic information like – Your Name , Computer Name, Login Info (Username, and Password). Then relax (or You may skip some language packs during the installation to reduce the installation time) until the installation is complete. step #6 : That’s All. Did you expect more steps, sorry to disappoint you.. Restart the computer. Procedure is same as described above, just skip the 2nd,3rd and 4th steps, Instead of that burn the ISO file to CD or DVD and restart your computer. Then follow the steps 4 and 5 as described above. If you have any problem during installation, then let us know, Reply through the comment box. i am getting truble in installing ubuntu 11.04. when copying files to disk it shows some error. After that installation will stops. i am also getting truble in installing ubuntu inside windows. It directly goes to partition manager. I installed Ubuntu but in device for boot loader, I gave the partition where Ubuntu was installed. Do I have to give the entire hard disk for installation of boot loader since Windows starts on boot. No dual boot option is available. 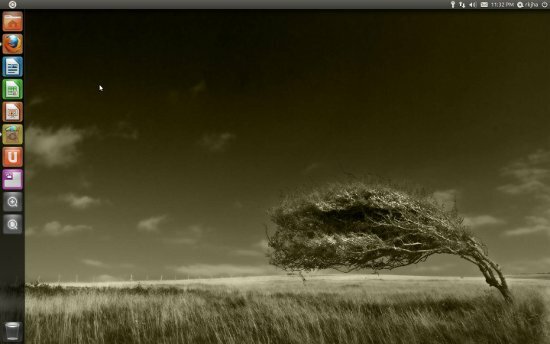 I have a Ubuntu 11.10 live usb made with LiLi USB Creator. When I boot from the drive all of my hardware is correctly and everything works great. I want to wipe my old computer and install it stand alone. Everytime I install from the USB (3 times as of this writting) I get no sound, no mouse and it thinks I have wifi instead of wired and I can not get online. The computer is a HO d530 CMT (full tower) with a gig of ram and both original hard drives (40gb and 80gb). What should I do to get it to install/detect hardware correctly? 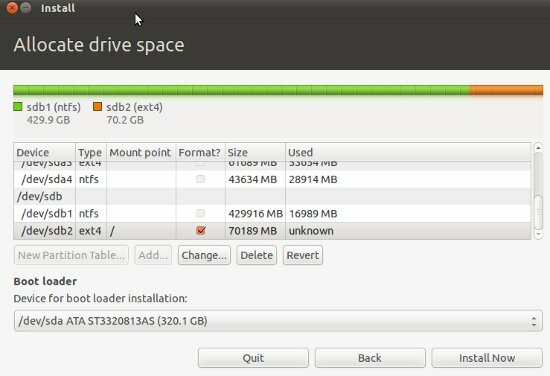 Also how do I set it up to read both drives? Do Not use select that option unless you have a backup of all important files. It may delete all partitions along with the files.